A very interesting report has been published by ericsson about the changing viewing choices, behaviours and preferences of consumers. The full report can be downloaded here. It is quite concise for a report. Videonet has published some of the interesting findings in an article. It makes a leap by stating that only one to two content aggregators will be able to supply the user. But in a family that may be two (or three) per person; some of it may be free or advertising sponsored content. It does notice the diveriging viewing behaviour: away from a single programme per family to multi-viewing in the same room. Exactly that is what is happening in my home as well. Content discovery is quickly diverging also – this is a crucial development. This report is an interesting measuring point in a field that is quickly evolving. This will move faster and faster as 2nd screen personalized viewing will become the norm (whereas now it is still a clear minority). There is now a clear trend that linear TV is clearly preferred for “live” events. I.e. VOD is better for the rest. This will have a huge impact in the industry. I.e. Netflix will win hands down from all multi-channel offers. SVOD is clearly a winner over T-VOD. T-VOD will remain an option only for heavily promoted premium content. Maybe a T-VOD type should be offered that increases the bill as you watch the content to the end; content should simply promote itself. A 2 hour movie; 1 hour for free, and 2 euro for each half hour after that. With TV series first episodes could be for free etc. Plain old TV watching is the killer app. Low on the list of must have are the typical interactive TV features; but they have been presented far too abstractly. This is not representative of their potential. But in the end: we should not overestimate it. The killer interactive app is VOD / catchupTV; everything else pales in comparison. Consumers want à la carte but value aggregation | Videonet. Interesting article on Videonet about an IHS study that shows that smaller content owners could go direct (via OTT) to the customer rather than via a (PayTV) network operator, especially in smaller markets. 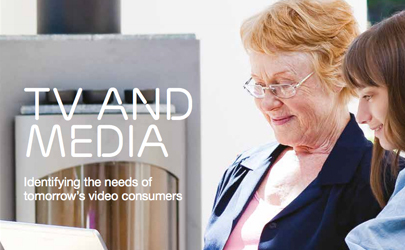 Videonet makes the sobering remark that seperate subscriptions become messy: i.e. that is a role for the “super operator”. Also there is value lost in disaggregation for the user: in a larger bundle the user can comfortably try, pick and choose, discover and switch, whereas he would need to make rather preselected single minded choices with separate subscriptions. Also bundles can have something for everyones taste in the family. For me personally that is a much stronger killer argument for bundles than the administriative headache of multiple subsciptions (I would not have more than 3 anyway). So though OTT seems to move power away from network operators, super operators or aggregators, however you want to call them, it is non trivial to bypass them. Smaller pay content owners could lead Pay TV breakaways | Videonet. In the near future you will be able to display UHDTV from your mobile to your ultra big HD screen with a MHL3.0 cable. The specification will be released early september on the MHL tech website. Not the typical application most of us had in mind for our mobile, but with the insane resolutions of the small screens today and the possibly increasing role of the second screen for navigating content and being the source for the big screen this may make sense after all. May that wire reach all the way to the couch: i.e. probably an every day TV viewing alternative. This comes on top of all of the wireless alternatives. Note MHL also competes with MyDP (a DisplayPort derivative), which has much less market support so far. But also MHL support on mobile devives is still very modest. This is cloud-tv going extreme done by Ziggo. It is based on ActiveVideo (former Avinity) technology that can stream the graphics on top of the video in a one-to-one VOD channel from server to client. Ideal for lower end settop boxes and retail CE devices, where it avoids the complex APIs for running applications locally on the client. Still: even with a thin client there are some issues: CI+v1.3 based TVs have to provide IP connections to the modules, but unfortunately the response time of some of the TV implementations is poor, leading to sub-par user experience. Ziggo is addressing this with TV manufacturers. Nevertheless: despite this small hickup, the seamless launching of new applications on a uniform platform will be the greatest asset of this approach. The most typical alternative to this approach is to use HTML4 or 5 browser technology on the client. That is also coming along of course. But some older clients haven’t got such browsers, and could not even be upgraded to run them. Browser implementations always have their individual quirks however. But browsers mix well with OTT, the ActiveVideo technology cannot work in high latency video environments and needs a direct low latency cable or IPTV connection. 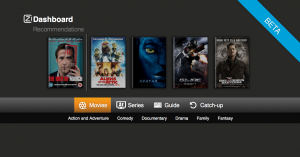 Ziggo reports 150,000 Cloud TV users. Maybe Mr. Eric Schmidt likes his smartphone more than his TV remote, and that explains why he thinks TV is dead. But still, that big screen is something that needs to be addressed, be it from a google Android powered phone or a chrome browser. And that works with a little HDMI stick for $35 called Chromecast. Also Netflix, YouTube and Google Play Movies applications work with Chomecast. There is an SDK to develop new Chromecast enables applications. Here is a decent review on Engadget and the WSJ. The stick allows content to be selected on a smartphone, chome browser or specifically enabled app and streamed to the stick. The remote control is done with the smart-phone or the browser platform. A simple but potentially very powerful paradigm. Is this a significant development or yet another TV streaming add on? At minimum it’s significance is that streaming content to a TV that is accessible on a smartphone or on the web via a (chrome) browser has become easy. That may attract some people. Is it a real game changer though: will it take away the user interface from the TV and put it in the hands of the smart-phone app? That is much less likely for a number of reasons. But it does challenge TV manufacturers and PayTV operators to come up with better and more convenient ways to provide access to content. If the second screen becomes dominant in content discovery for the big screen, the TV may become that dumb screen it is today in so many settop box equipped homes. PayTV operators may loose out offering that high premium content they create their margins with. But there is still a long way to go for that. 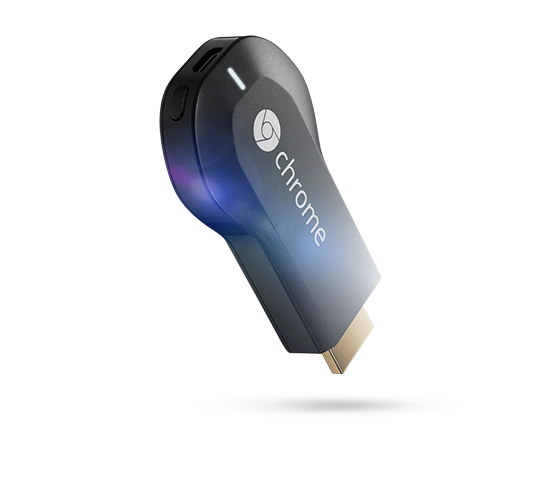 A more synergistic path could be the integration of Chromecast in TVs. Superficially speaking the hardware could probably be absorbed by new connected TVs, but the question is whether the software can be integrated easily. Of course it does require manufacturers to come terms with permitting a competing content navigation paradigm to gain easy access to the big screen, competing with their own smart TV functions. But on the other hand: there are already many external content sources, wireless HDMI and wifi based ways of streaming content to TVs, so why be paranoid about this one. The short term key issue for Google it probably simply to quickly gain more access to TV screens for their services YouTube and Google Play. The $35 pricetag suggests a device at barely more than factory price. This is a plain old service provider sponsoring settop box type model, analogous to the BSkyB launch in the UK of the NOW TV box for 10 UKpounds. The real comparisons are to Roku and Apple TV. The Roku streaming stick even has the same form factor but a much more constrained application (due to it’s reliance on MHL interfacing and other interoperability issues between the host TV and the stick requiring a certification programme). As a conclusion: Chromecast tries to establish a video publishing platform for streaming services with a google centric model. It is pretty open and neutral, but it will of course have a google heart. Videonet has published an interview with two TV industry insiders about the big picture implcations of Chromecast similar to the ambitions of this article. The ambition of the interview is not met however: no significant arguments are brought forward on why Chromecast is not simply a (potentially inconvenient implementation of) a wireless screen casting technology. The article even branches out to the use of “stick technology” to replace settop boxes which is irrelevant to the main issue. In all fairness , in the interview Steve Hawley (Industry Analyst) does characterize it well, albeit a bit negative: It is disruptive, but not because it’s entirely new. Chromecast can be simply another distribution channel for pay TV and OTT content providers, and in turn, it becomes yet another platform for them to develop and test for. There is also a good early analysis by Jim O’Neill, US industry insider that helps to provide background to this topic that deserves a reference. It specifically adds more views on the content that google can now bring to the user with its platform.